GUISELEY manager Steve Kittrick insists that if the Lions make it fourth time lucky in their quest for the Blue Square Conference in 2013-14, they will in a far better position than they would if they had gone up this month. Kittrick recently committed to the club for another season, along with backroom staff Chris Holland and Martin Stringfellow. And despite the hurt of a third successive Blue Square North play-off failure having not yet gone away, he has been energised by the Lions’ board’s plans for next season on and off the pitch – even though his playing budget will be slightly reduced for 2013-14. 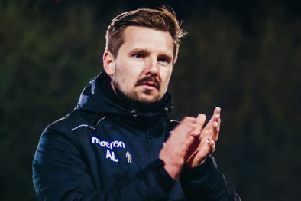 Kittrick, who took over at Nethermoor in November 2007, said: “If we get the opportunity to go up at the end of next season, we will be in a lot better position off the pitch than we were this season. It’s step by step; we will get there. “The budget has been tweaked a bit. But I don’t think there’s a budget in the country that hasn’t. “The pleasing thing is the board are spending money on the ground to make it a good standard and we’ve got an academy that we are getting right. “If we get the facilities and long-term have our own academy and we do things right, we can bring our own players. The ground has changed in the past three or four years and in a couple of seasons, it’s going to be a top place to be. We are progressing on and off the pitch. “Last season was a bitter pill. But you have to take it on the chin and get on with it. “The plan still is to get up into the Conference in the next couple of years, with us more well prepared off the field and with better facilities for everybody. Kittrick remains confident that a number of Lions players will commit to the club next season in addition to those under contract in Gavin Rothery, Jack Rea, Wayne Brooksby, Phil Marsh and Zack Dale. One of the contract players has already left, with forward Kevin Holsgrove joining FC Halifax.